I’m not sure where I found this gem. It is not in Ken Scott’s archivist and the only album I’ve found so far from Brazil. No doubt there were others. This is in English. 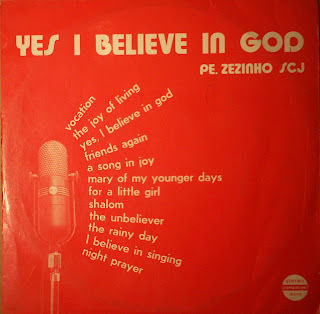 Padre Zezinho, SCJ is still recording and has several more recent album on his web site. I was actually really disappointed with this album, I find it bland. I guess I just expect too much from Brazillians when it comes to football and music. It’s their own fault for demonstrating such panache and brio on those two fronts !! For me a bland piece of Brazilian art is a contradiction in terms ! It just does not compute in the hard drive of my mind !! As for this guy, even his name swings ! I really like the musics of this singer. Pe. 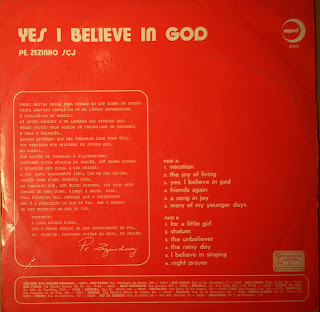 Zezinho, SCJ is one of the best Catholic Brazilian composers, having recorded more than a hundred of albums in Brazil and some others CDs in other languages. I was really looking for this album. Thanks! Wonderful! It is important to remember that this is not Brazilian Popular music, but religious music. The best I think. I know many songs by this singer in Portuguese and this is just a small example in English. I am glad to find this. Thank you.